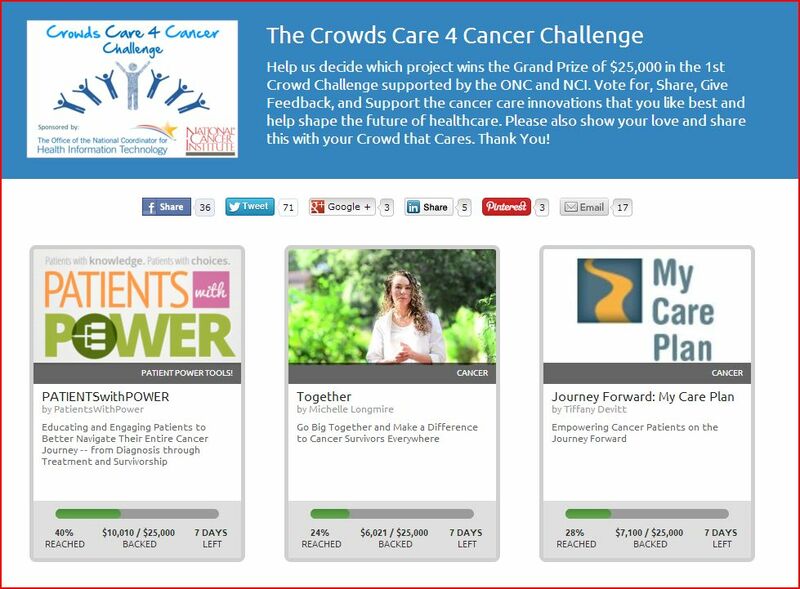 Since it’s launch on April 30th 2013, the joint Office of the National Coordinator for HealthIT (ONC) and National Cancer Institute (NCI) ‘Crowds Care for Cancer: Supporting Survivors‘ challenge supported by the Health 2.o Development Challenge and Medstartr crowd sourcing platforms has garnered a fair amount of national and regional attention. On the leading edge of fueling if not defining the patient engagement workflow/healthtech interface this vital public/private partnership format seems to be igniting the private sectors imagination while supporting development innovation with essential concept, seed or intellectual capital. As we publish this post the finalists are in their closing days of crowd source funding. The leader board and individual app pages can be sourced here. This second and final round of competition will award the first place prize to the application that receives the most amount of funding support. For individual pages, see: Patients With Power, Journey Forward: My Care Plan and Together.The response to the request for submissions exceeded the sponsors expectations by a 3x multiple, and according to many of the judges in the process the applicant pool was of very high quality making the judging process somewhat of an unexpected challenge. For complete program details, see: Crowds Care for Cancer Challenge: Supporting Survivors.